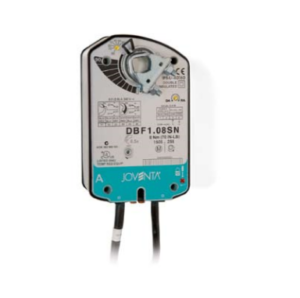 Modern, Functional and attractively styled that is how the JOVENTA range of actuators present themselves whether they be air control dampers for HVAC systems or spring-return actuators for fire and safety dampers. The complete range extends from 4 to 40 Nm. And, not only do they fit any damper spindle but, thanks to their extremely compact external dimensions, JOVENTA actuators are also ideal when mounting space is at a premium. Careful design allows easy access to and use of the operating and adjusting controls and devices on the units. Another key factor from the economic point of view is that power consumption is extremely low. JOVENTA actuators have the ability to keep your plant and equipment dependable under any circumstances. When necessary there is also the SLC system to provide remote supervision of actuator functions, damper positions, duct interior temperature and ambient temperature. Conventional solutions – those using input and output signals – can also be provided if the customer wants them. JOVENTA actuators conform to CE requirements and have all been EMC-tested. They remain very quiet in operation throughout the whole of their service life too. So, all in all, their total performance allows every single occupant of every single room in a building to enjoy a feeling of total well-being, comfort and safety.